Honeymoon Offer – Stay for your honeymoon and save upto 30% off accommodation rates. Please contact us for further details. Combine superb staff, sophisticated design and huge comfortable rooms with a breathtaking setting such as the Maldives and you have got the perfect recipe for a blissful contemporary retreat. This resort is brimming with unique amenities to keep the most seasoned travellers happy. With just 44 select bungalows and pavilions, fitness facilities, exciting excursions and the piece de resistance the world’s first underwater spa. There is a whole host of exclusive spots for you to disconnect from the real world, including the outdoor salt-water floatation pool and the fibre-optic lit infinity pool, which is stunning at night. The food here is some of the best in the Maldives, the highlight being a gourmet seafood restaurant complete with unique over water experience setting. The level of glamour, variety and quality at this resort, not to mention the warm hospitality, is enough to make you want to rip up your passport and never to go home again. Up To 4 Free Nights – Applicable dates – Stay 7 nights pay for 5 & stay 14 nights pay for 10. Early Booking Offer – Book at least 45 days in advance and save up to 35% off accommodation. Honeymoon Offer – Stay for your honeymoon and save upto 30% off accommodation rates. Designed around a philosophy with reverence for nature and the restorative powers of water, the spa features the world’s first ever underwater spa treatment rooms. Allow the tension and stress to melt away under the experienced touch of trained therapists offering a range of massages and wellness treatments as well as yoga and personal training sessions. The resort incorporates various facilities designed for pleasure and relaxation including a yoga pavilion, fibre-optic lit infinity pool, outdoor salt water floatation pool and a library/television and internet room stocked with literature, CDs and DVDs. Get active and blow away the cobwebs with some water sports, both motorised and non-motorised are available. Choose from a range of excursions such as PADI diving, sunset fishing on a traditional Dhoni, big game fishing and sand bank snorkelling. A 65 foot luxury cruiser called ‘Symphony’ is also available for hire. Few other honeymoon destinations shout extreme luxury and romance like the Maldives. Arrive in style, either by deluxe speedboat skimming the azure coastline or soar gently towards the island by private seaplane, and feel like a million dollars as you enter a true gem on the Indian Ocean. This recently re-developed multi-million dollar resort offers a honeymoon experience ‘Like No Other’. With care for the environment, local people and sustainability Per Aqumm have created an exclusive resort with the perfect formula for a romantic trip of a lifetime in one of the world’s most sensational locales. A honeymoon in the Maldives is privileged trip only possible for a fortunate few. At first sight of the eye-popping landscape you are bound to be blown away by the depth and purity of colours that create the backdrop to you holiday. The serene natural environment is paralleled only by the highest standards of facilities, service and quality. 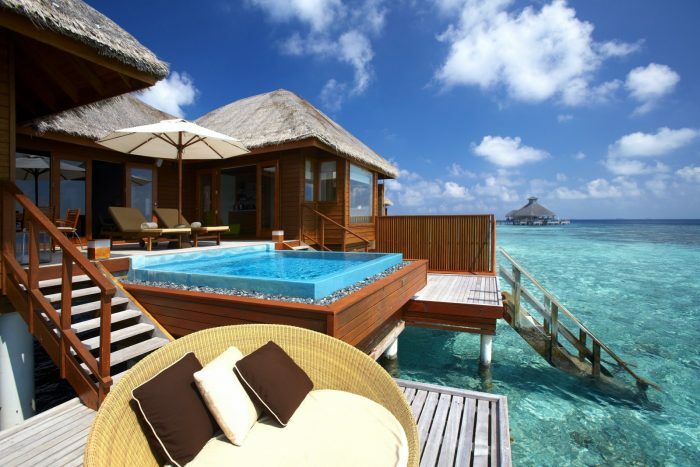 Huvafen Fushi has got luxury honeymoon stamped all over it, what are you waiting for? Huvafen Fushi pride themselves on serving the best quality produce flown in from around the world for their varied choice of restaurants, serving everything from Mediterranean to Asian inspired dishes. Celsius – An all-day dining restaurant with indoor and al fresco seating, Celsius serves international cuisine with lagoon views. UMbar – Perched over the inviting infinity pool, UMbar is well-stocked with all your favourite drinks and designer cocktails to boot. Raw – Nutritious food needn’t be boring. Raw lives by this ethos providing innovative healthy food and drinks made with fresh ingredients. Salt – Head to Salt for an unforgettable culinary journey inspired by flavours from the Mediterranean and Southeast Asia. The extensive menu particularly emphasises freshly caught seafood from the local area. Vinum – Wine connoisseurs will delight at the selection of Old and New World wines from across the planet hand picked by the resident sommelier. Bungalow Dining – Dine in the privacy of your own suite with a tempting 24 hour room service menu.